Black Diamond's HiLight is basically a next generation version of the Firstlight, continuing the crazy-light tent tradition with a few added perks to boot. Unlike the Firstlight, the HiLight has a third cross-pole up top that creates a small but functional awning (the same design employed by the Lighthouse and Oneshot). Those of us who've gotten doused getting in and out of the old Firstlight when the canopy was wet will love this feature. Also lovable is the HiLight's much improved ventilation. The Firstlight can be a tad claustrophobic. In comparison, the HiLight offers a more open, livable space. It's also light: 2 pounds, 15 ounces (tent & poles - measured), making it heavier than the Firstlight by a modest two ounces. Thanks to the cross-pole design, steeper walls, and a trapezoidal floor, the HiLight feels roomier inside. In real terms, both tents are almost identical in size—cozy for two, spacious for one. 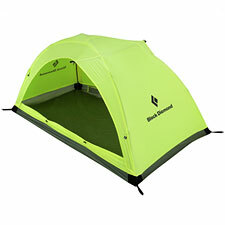 As with the Firstlight, the HiLight is a freestanding single-wall tent. There is no rain fly. Water-resistance and breathability are handled by the body fabric, which is made of a siliconized nylon fabric called Nanoshield. The somewhat ambiguous waterproofness (or not) of these single-wall tents is the subject of some discussion on the boards. Be aware that Nanoshield tents can saturate and begin to seep in extremely wet conditions. The potential problem scenarios include climates with very high humidity, and multi-day trips with sustained rain. For the more typical backpacking trip, featuring overnight thunderstorms or a day or two of rain, most people do just fine. Note, however, that Black Diamond's Nanoshield tents are not seam-sealed. You'll need to do that yourself before you use the tent in the field. Though billed as three-season shelters, I think Black Diamond's single-wall tents really shine in winter. You can completely seal up the HiLight (unlike many mesh-based double wall designs), preventing blowing dust or snow from getting inside. In addition to the Nanoshield fabric's natural breathability, ventilation is accomplished via two mesh windows below the awnings, which create an ample cross draft. I recommend relying on the windows for ventilation. Two people sharing one HiLight will otherwise produce a good deal of condensation (though no more, certainly, than any other completely-sealed tent). The HiLight fits an optional vestibule which extends the front of the tent, creating a cooking space or extra room for gear. The vestibule adds 14.6 ounces, not including two extra stakes. The HiLight, like the other Black Diamond single-wall tents, is probably not ideal for the entry-level backpacker. Is is easy, for example, to poke the tent poles through the floor during setup if you're not careful. But for more experienced users, and especially as a freestanding solo shelter, the HiLight (and Firstlight) is unmatched.